The BFG (1982) is Roald Dahl's beloved children's story about a "Big Friendly Giant" and an orphan girl named Sophie who befriends him. It was adapted from Dahl's book, Danny, the Champion of the World (1975) and dedicated to his late daughter, Olivia, who died of measles encephalitis in 1962 when she was seven years old. Sophie sees the giant pass by her orphanage with what looks like a dream-catching trumpet and a suitcase. She tries to hide, but he picks her up and takes Sophie back to his cave. At first, Sophie is scared the giant will hurt her, but he assures her he is friendly. The BFG tells her that she must stay with him forever, as no one can know of his existence. He tells her it's dangerous to leave the cave, as his neighbors are sure to eat her if they catch her. 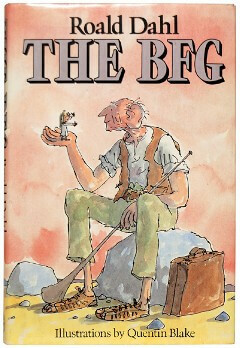 The BFG then explains the importance of the trumpet and suitcase. He catches dreams, stores them in the cave, gives the good ones to children all around the world, and destroys the bad ones. The book was adapted for television in 1989 and an animated film by Steven Spielberg in 2016. Return to the Roald Dahl library.